but the ancient ways are still around us. Natalie and Darren Purkey are southern Idaho natives, They met at Meridian Jr. High back in 1979, fell in puppy love in Mrs. Fishers choir class and held that beautiful flame for each other until one day in 2008 when they reconnected thru a series of fortunate events and have remained in gooey love ever since...not the end! At Victory Stone Engraving, we look forward to designing a custom engraved stone that you can be proud of. 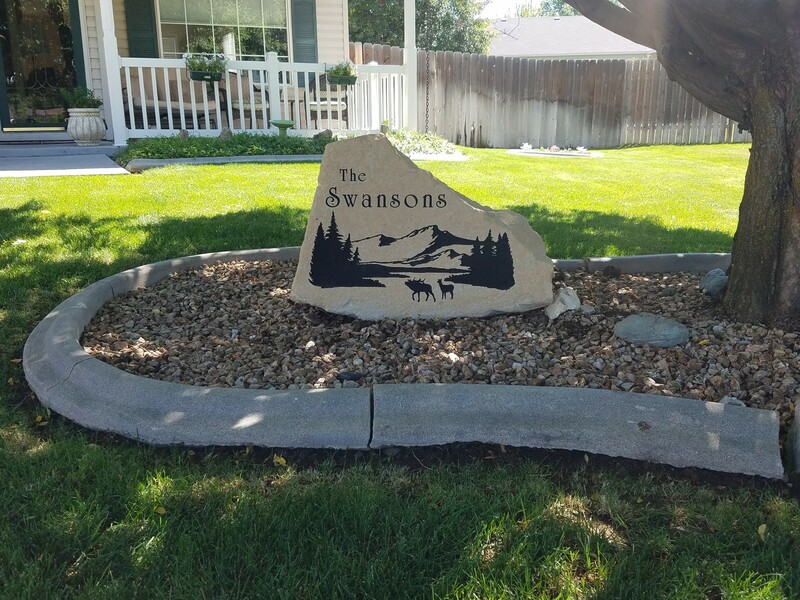 Because we only use high quality materials for your custom project, you can be sure it will last throughout the years, despite Idaho's unpredictable weather. Display your address and/or the name of your residence. turn a bland business sign into something eye-catching that will last for years and look great anywhere. A decorative picture piece for the ultimate landscaping decoration. Whether you need a unique design for your home or something for your business, we can make it happen. throughout the years, despite Idaho's unpredictable weather. Ready To order your own custom engraved stone? Order here. Need a custom quote? Call us at 208-880-7642.